In front of one of my favorite barns, a place that has taught me woodworking. It is a place of immense creativity and camaraderie. Here are some iconic barns, a part of Mormon Row, in front of the Tetons in Grand Teton National Park in Wyoming. In the 1890's a group of 27 homesteaders clustered in these pastures in front of the majestic Tetons. Now visitors come from all over the world to view the much photographed barns, remnants of an earlier frontier history in the Jackson Hole Valley. The area is called Antelope Flats. All of my life I have had a fascination with barns. I love every variety--the tilting roofs with bare scaffolding that show every patch of weathered vein in the wood. You know the one that looks like it is slumping, crumbling, begging for a new friend--the kind I crawled around as a child. The spacious, light-filled beams in other barns can resemble a nave in a cathedral, giving awe-struck, even reverent moments and revelations. Sometimes, if we listen long enough, a barn can unravel long-held secrets. Like people, they have personal traits and characteristics in their spaces that are unique to them. No barn is the same. They each have a purpose to their story--whatever their anatomy. Barns are a symbol of someone's heritage, their life choices, opportunities, and what they reaped. They are a reservoir to store precious livelihoods, keeping animals that allowed them to retrieve their harvest. Both mammoth and small barns were made with keen design and skill, and attention to every joint and nail. As my boys dismantled an old barn this summer to retrieve the beautiful reusable wood, my son commented, "I was amazed at the arduous work that I could see someone had done eighty or so years earlier. As we pulled out the long, rusty nails, I could see the care someone had taken to build their barn. 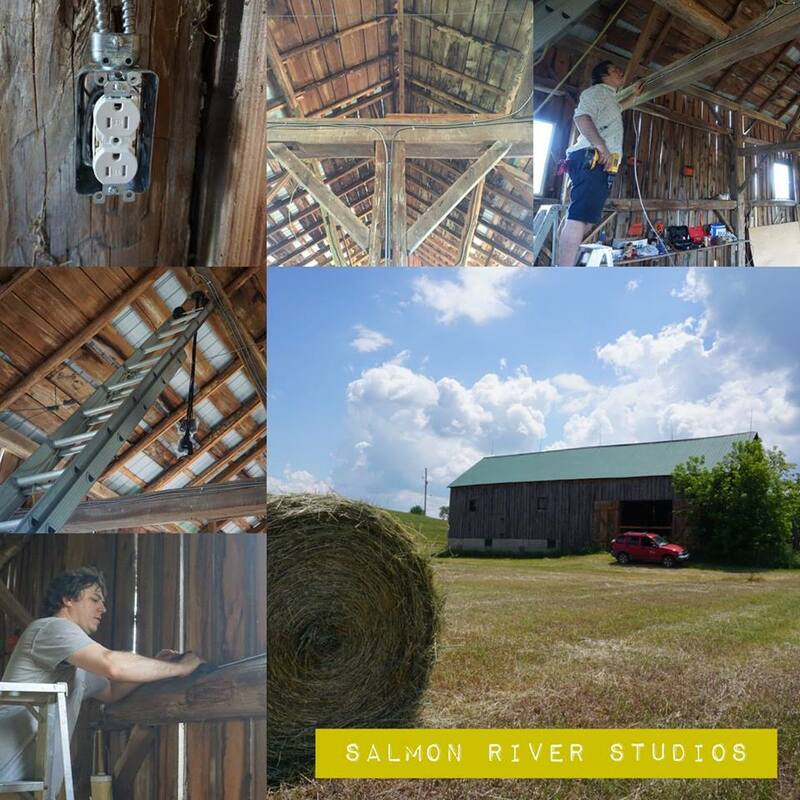 I wanted to preserve as much as the wood that we could for the next chapter in the barn's life--to make an art barn." Indeed, they knew they were in a special territory, where some unknown people had sacrificed and toiled. It only seemed right to gather as much as they could to use again. My son, Elias, who has been helping to make an art barn this summer. Part of the work team to dismantle "the old barn" that will now have a different purpose: to fuel a desire to create with art. The windows, some that will have access to a loft, will have views that inspire painting, writing, and sculpting. Here is another famous barn in Heber Valley, Utah, called the Tate Barn. It is located just below Soldier Hollow, where there was the cross country runs for the 2002 Olympics. Barns are typically rooted in seasons of harvest, tending animals, and family celebrations. But they are also monuments to strong people who were resilient in long ago storms. Like the joints of wood that solidly bind barns together, they connect us to other times and tales. Barns can attach us to groves of trees, meadows, fields, and rivers that are hallmarks in our hearts. With their soft moans and howls on icy nights, barns shelter us. On summer days with the sun glistening through the shadows, they make us feel safe, and at home within their walls. Barns allow the smells, sounds, and close proximity to nature that most homes cannot give. They are a link to the land, that all of us crave, whether we know it or not. Several years ago we thought we might relocate to upstate New York, and I began to search for a new home. The reason that I fell in love with a property outside of Rochester was not the 1820 house, but you guessed: it was the beautiful barn on the land. As I roamed through that renovated barn, I could envision lively Halloween and Christmas parties, with plays and music with friends and family. The empty stalls seemed perfect hiding places for frolicking children. But it was not to be. We did not move to upstate New York. But other barns have kindly compensated--to inspire me with beauty, friendship, and creativity. My circle of relationships have been widened, as I remember and am linked to the people who toiled within the barns that I love. An old weathered barn, one who has known many seasons, invites you to enter his past. And as you come in, an old barn can whisper true tales--not only evoking former days, but infusing a deeper sense of history, a desire to create, a love of community. I believe everyone should have at least a few memories in a barn. Never underestimate the power of a barn. 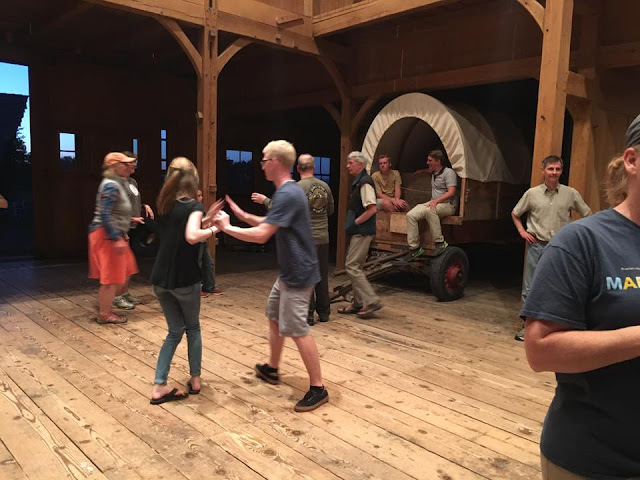 A barn dance, with people of all ages, enjoying a square dance. A wonderful friend and artist, working in a barn. He is describing to some young people the correlation between clay and The Potter in Isaiah 64:8. The scripture reads, "But now, O Lord, thou art our father, we are the clay, and thou our potter, and we all our the work of thy hand." A barn can be a place of immense creativity. The paintings of nature on the wall, the woodworking, and in another corner is where artists can create pottery. 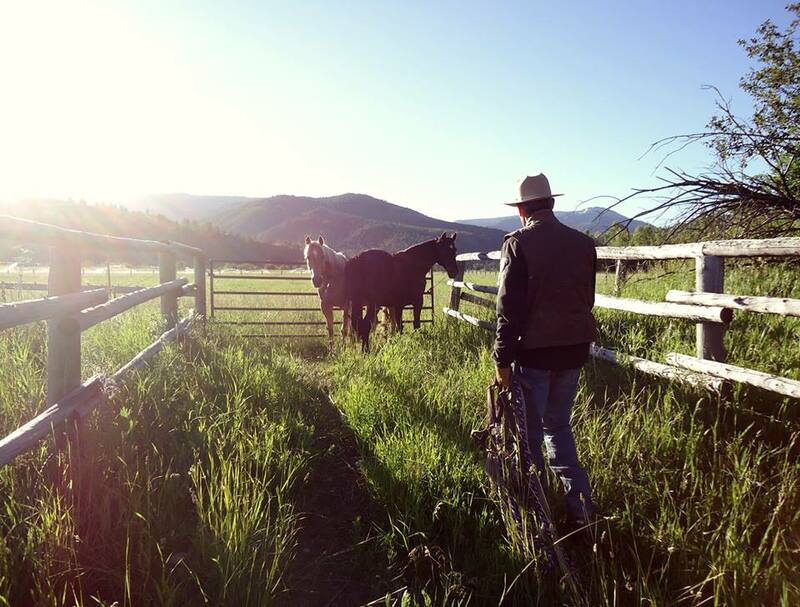 It's satisfying to get out and work in the fields--to get away from 21st century distractions. A pumpkin farm in upstate NY. Barns just naturally go with autumn. 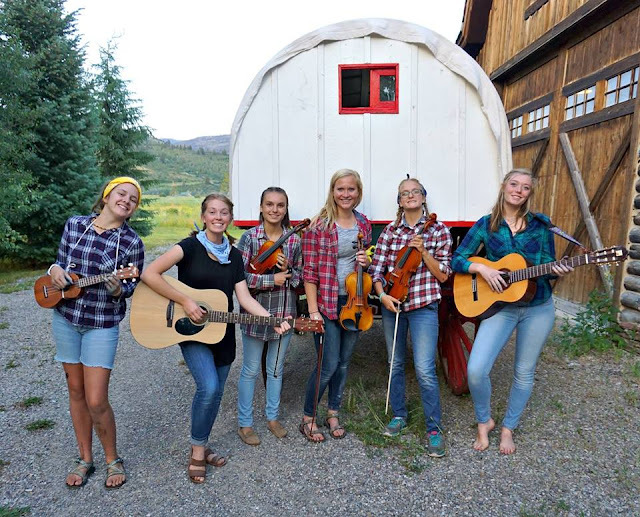 Being part of a barn dance this summer. These young women spontaneously put together a barn dance, providing the music for the gathering. It was a night we will all always remember, maybe because it was in a barn? I shan't be gone long--You come too. I shan't' be gone long--You come too.